to have a few practice runs. have embroidered on Christmas Stockings. 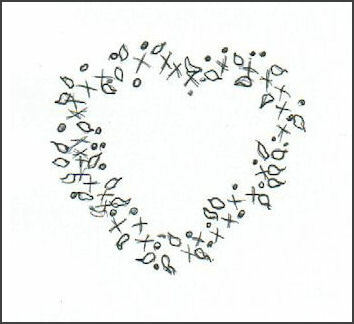 is to make them in detached chain. Make a slightly longer peak at each tip. Gold Seed Beads, Metallic Gold Thread. Step 2: Place Ribbon Stitches around this circle. Some to the outline and a few outside of the circle. overlapping the first petals, and of varying lengths. comparison to flat against the fabric. 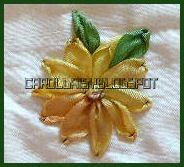 A gold bead in the centre and two Ribbon Stitch Leaves. Step 4: Add the gold seed beads in the centre. Stitch in the gold metallic thread around the petals. Green Leaves and Gold Beads and Thread. .5 Metre of DMC Metallic Thread or substitute. Stitch. in a clockwise manner. Step 3: Buds are in Ribbon Stitch also. and one fly stitch around the base of the Bud. scattered around the outside of the flower spray. the Paler colour. Make sure you stay in sequence when changing ribbons. taking the needle back through. This will be part of the rose tip. tip of the rose bud in green thread. Step 4: Leaves are in Ribbon Stitch. Spider Web Roses with Fern and Baby Breath. Spider Web Roses with French Knots. Green Embroidery Thread to Match Green Ribbon. Fawn or Olive Green embroidery thread for Fern. 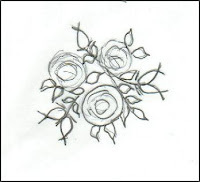 Option of a Pearl for the Centre of 1 Rose. the top rose are one straight colour. Step 2: Next work the buds in Detached Chain Stitch. Add 2 straight stitches at the tip in Green Thread. the buds and leaf stems. Lazy Daisy Leaves on the two branches. Step 4: Rose and Bud :Leaves in Ribbon Stitch. Refer Stitch Tutorial on this blog. Silk Ribbons in three complimentary colours. Lazy Daisy Leaves in Cream Embroidery Thread. Lime Green Seed Beads stitched down amongst the flowers. Measures: 7 cms across x 6 cms high. approx. 1 metre of each colour. from between or under the flowers. Of course you may wish to use it in another application. The colours are just as a suggestion. 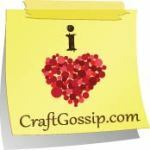 Whatever ribbon scraps you have in your sewing box could be used. 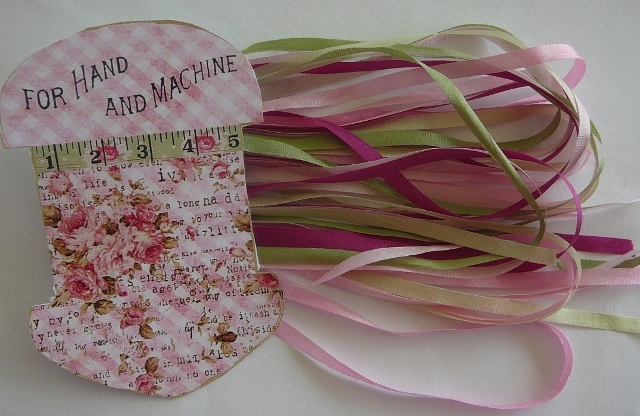 Ribbons: 4 mm.- Pink, Lemon, Blue, Yellow, Green, Pink /Purple. Threads: Green, Yellow, Lilac Embroidery Threads. Beads: Small Pearls for the Daisy Centre. with tacking stitches to hold the two together. 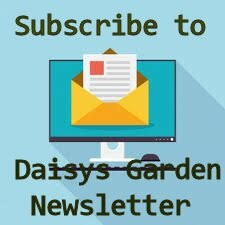 for the centre daisy. 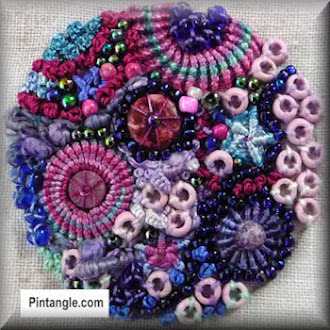 Stitch the Pearl into the Centre. centre, using 1 strand of thread. 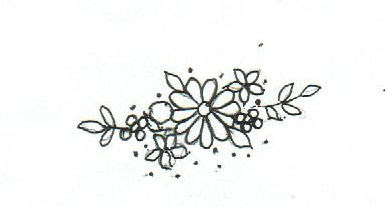 the petals of the larger daisy as shown in design. These are some interesting facts that I have just discovered about Carnations. I am working this in Cascade House Bias Silk Ribbon 10 mm. .5 Metre of Green Embroidery Thread. Step 1: Using an erasable pen mark out the stem of the flower. With 2 strands of Emb.Thread stitch this in Chain Stitch. Step 2: Wrap the Chain with 2 strands of the same thread. This gives a more raised stem for the carnation. the outer edge of the circle. Step 4: Continue with the gathered petals for 2 layers. 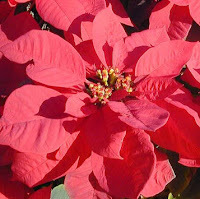 the petals smaller and tighter for the centre of the flower. just alter the size of the circle to suit. Such as in the photo below. Just love the colours in this dress. Every tone of Pink that you can imagine. display board at the exhibition. Delphiniums are a hardy perennial, beautiful and tough. They are normally associated with large, English-style gardens. Tall and stately, delphinium flowers come in purple, white, pink and blue. As a group in an embroidery, varying in height and colour, they are so effective. Hand Dyed Ribbons work well with these, the colours change as you create. 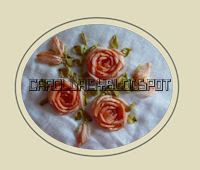 Ecru, white or cream Embroidery Thread. Step 1: Work a line of stem stitch for the centre stalk . Mine is 5 cms. in length. Not necessary to be a straight line. After all, the Delphiniums are not perfectly straight. needle back through the Ribbon close to the fabric as below. the French Knots a little tighter and smaller at the tip. Leaving some of the Green Stem showing. French Knots in the centre of the Flower heads. base and Ribbon Stitch Leaves. more securely in place, even when washing. the Mon Francais Jardin - Wheelbarrow Kit. 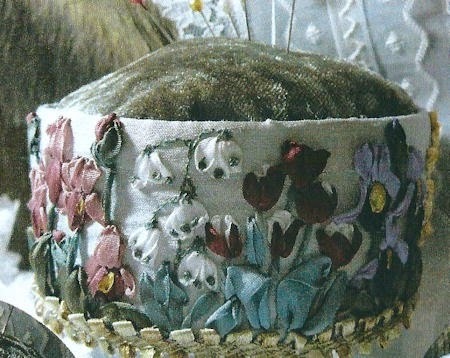 the aristocracy adorned their clothes with Silk Ribbon Embroidery. 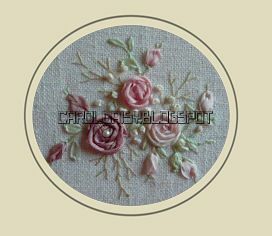 Embellished with Ribbon Stitch, Gathered Rosettes and Loop Flowers. which will be on Delphiniums. snowdrops can form impressive carpets of white. I have used 2 threads of a deep green. depending on how full you require each one. green to the larger ribbon for the leaves. the stem and flowers touch. as the needle is pulled through. to add a holding stitch in thread to hold in place. Green Ribbon Stitch Leaves to a Lace trim. A gold bee charm sits on top. or other gripping pad, it will help. Velvet covered with hand painted synthetic material, with silk lining. Leaves an essential in SRE Embroidery. There are many ways to create leaves. These are just a few of the ones I have done. Detached chain leaves with Stem Stitch. take the needle back through. 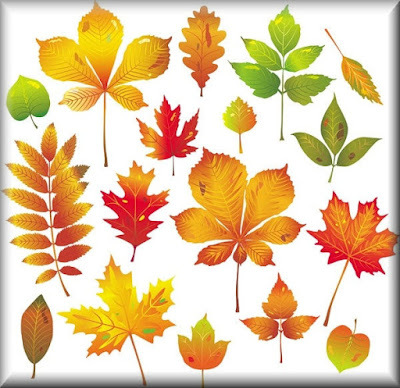 Gives a more pointed leaf. at the entry point and out again as shown. 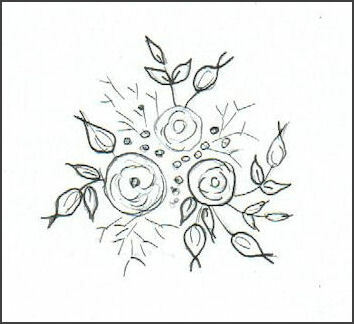 Use the stitches to form the shape of the Leaf. 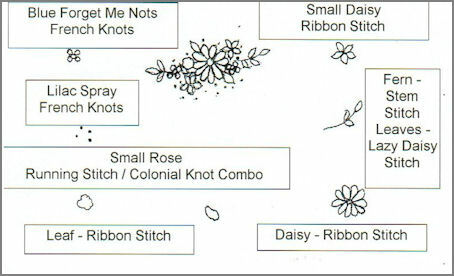 Ribbon Stitch in Organza Ribbon. Use thread to show the veins in the leaf. Great for adding to Larger Folded Ribbon Roses. the stitches already shown in the previous tutorials. we can delve into this at a later date.